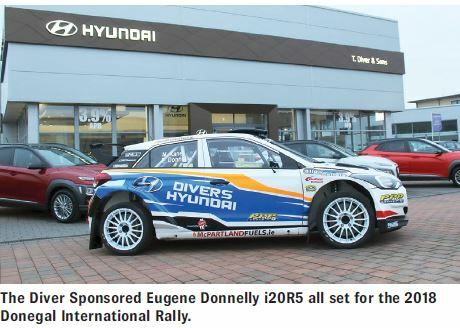 The Hyundai National Event takes place this weekend and here at Divers Hyundai on Canal Road, Letterkenny we are looking forward to welcoming customers old and new to our premises. (www.diversgarage.ie). It’s hard to believe that we are only seven weeks away from the 191 registrations and this weekend affords you the opportunity to come along and talk to our sales team about the offers that are available for 2019. This Thursday 8th and Friday 9th we are open late and we are open on Saturday 10th. From 10am and also open on Sunday 11th from 11am. 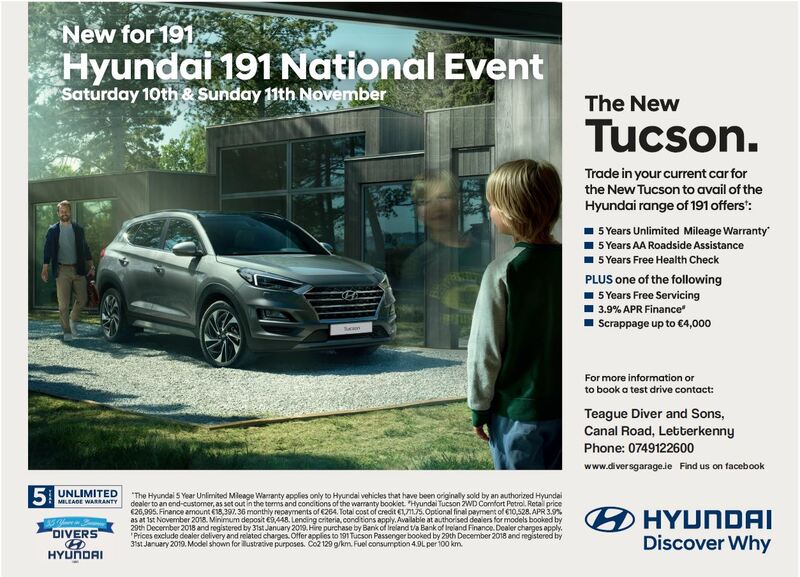 It’s exciting times for Hyundai as the brand continues to grow in popularity and with such an incredible demand for SUV’s in recent years the National Event open weekend will have a complete new SUV line up for 2019 which includes the four new additions namely the 1.6 Diesel Kona, the Hyundai Kona Electric, The all new Hyundai Santa Fe and the Hyundai Tucson. Many people are looking forward to seeing the new facelift Tucson the car that has taken the motoring world by storm since its launch in 2015. There is no doubt that this stylish new facelift model will continue to contribute in no small way to the success story that is the ‘Hyundai Tucson’. This year saw the launch of the exciting new Kona that entered the market as a 1.0 petrol turbo and its popularity has been staggering. To compliment this the all new 1.6 Diesel Kona was recently launched and you will also be able to test drive the full electric Kona that has up to 482 kms driving range on a single charge. This versatile and very fun to drive Kona Electric is a car that is going to be in big demand and is the first electric compact SUV in Europe. When it comes to 7 seaters the all new Hyundai Santa Fe is simply very different class. There’s also great news for Hyundai i20 customers because it too has been given a facelift which just takes it to a completely different level. Of course the ever popular Hyundai i10 : the Hyundai i30 and facelift i40 continues to be three of the most popular cars in the Hyundai range. The good news for customers who are thinking about purchasing new for the 2019 there is up to €5,000 scrappage available or you can choose from 3.9% Finance or 5 years free servicing. When you come along and talk to our sales staff you can sit down and discuss your own individual requirements and they will answer any questions that you might have in relation to your purchase. You may choose the 3.9% Finance deal when purchasing your new car but every situation is different so when you talk to our sales team remember that they can tailor a package to suit you. Here at Divers Hyundai we strive to provide you the customer with the best possible service and celebrating 35 years in business and 21 years with the Hyundai brand we pride ourselves in customer service. Terence Diver and staff welcomes you along to their National Event Open Weekend and takes this opportunity to thank you for your support down the years and looks forward to your continued support in the future.